M. Night Shyamalan was once the toast of Hollywood after a string of giant blockbusters, with some even calling him the next Steven Spielberg. But flop after flop soon landed him in diector’s jail, and he found a hard time getting out. Then he made the micro-budget thriller The Visit, which started to turn things around. He followed that up with the smash hit Split, and now, he’s able to bring a sequel to one of his early hits with Glass, which ties Unbreakable and Split together in one big finale ending trilogy. The director and his work is being celebrated this month with a very unique film festival, and it will include a screening of his latest work. 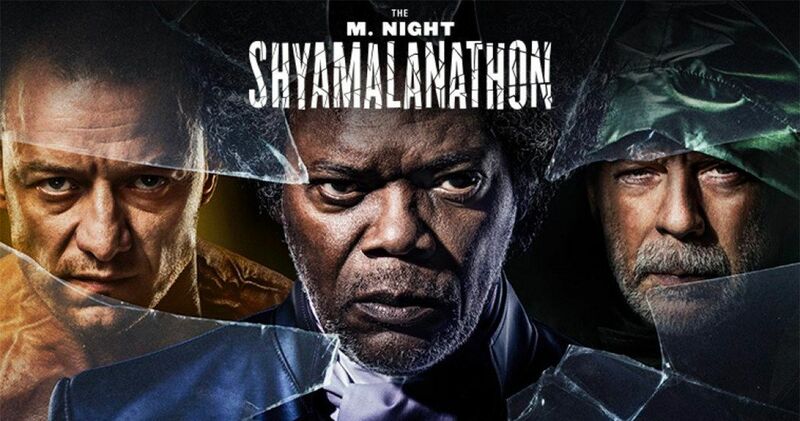 Alamo Drafthouse and Universal Pictures have announced the perfectly titled M. Night Shyamalanathon, the first-ever marathon screening of all three films in the filmmaker’s trilogy: 2000’s Unbreakable, 2016’s Split, and the first American public screening of the third chapter, the explosive comic-book thriller, Glass. The back-to-back-to-back screenings, available at Alamo Drafthouse cinemas in 25 theaters across the country on Saturday, January 12, 2019, will include an exclusive conversation with M. Night Shyamalan, broadcast live from Alamo Drafthouse Brooklyn into all participating Alamo Drafthouse theaters. Tickets are free, and seats can be reserved with the purchase of a $5 food and beverage voucher that can be redeemed at the show. Tickets may be reserved at: For Brooklyn, New York, Live Event: drafthouse.com. Participating Alamo Drafthouse cinemas include Alamo Drafthouse Brooklyn (Brooklyn, NY), Alamo Drafthouse New Mission (San Francisco, CA), Alamo Drafthouse South Lamar (Austin, TX), Alamo Drafthouse Ritz (Austin, TX), Alamo Drafthouse Lakeline (Austin, TX), Alamo Drafthouse Park North (San Antonio, TX), Alamo Drafthouse Stone Oak (San Antonio, TX), Alamo Drafthouse Yonkers (Yonkers, NY), Alamo Drafthouse Raleigh (Raleigh, NC), Alamo Drafthouse Mainstreet (Kansas City, MO), Alamo Drafthouse Littleton (Littleton, CO), Alamo Drafthouse Sloans Lake (Denver, CO), Alamo Drafthouse LaCenterra (Katy, TX), and Alamo Drafthouse Lubbock (Lubbock, TX), Alamo Drafthouse Montecillo (El Paso, TX), Alamo Drafthouse Cedars (Dallas, TX), Alamo Drafthouse Lake Highlands (Dallas, TX), Alamo Drafthouse Richardson (Richardson, TX), Alamo Drafthouse Las Colinas (Irving, TX), Alamo Drafthouse Denton (Denton, TX), Alamo Drafthouse Woodbury (Woodbury, MN), Alamo Drafthouse One Loudoun (Ashburn, VA), Alamo Drafthouse La Vista (La Vista, NE), Alamo Drafthouse Chandler (Chandler, AZ) and Alamo Drafthouse Tempe (Tempe, AZ). In addition, Universal Pictures has partnered with Beyond Fest and American Cinematheque to screen all three films, back-to-back-to-back, at the Egyptian Theatre on Hollywood Blvd. in Los Angeles beginning at 4 p.m. on the same day, January 12, 2019. Tickets may be reserved at everbrite.com. Glass opens in theaters in North America on January 18, 2019. In Glass, M. Night Shyamalan brings together the narratives of two of his standout originals-2000’s Unbreakable, from Touchstone, and 2016’s Split, from Universal-in one explosive, all-new comic-book thriller: Glass. From Unbreakable, Bruce Willis returns as David Dunn as does Samuel L. Jackson as Elijah Price, known also by his pseudonym Mr. Glass. Joining from Split are James McAvoy, reprising his role as Kevin Wendell Crumb and the multiple identities who reside within, and Anya Taylor-Joy as Casey Cooke, the only captive to survive an encounter with The Beast. Following the conclusion of Split, Glass finds Dunn pursuing Crumb’s superhuman figure of The Beast in a series of escalating encounters, while the shadowy presence of Price emerges as an orchestrator who holds secrets critical to both men. Joining the all-star cast are Unbreakable‘s Spencer Treat Clark and Charlayne Woodard, who reprise their roles as Dunn’s son and Price’s mother, as well as Golden Globe Award winner Sarah Paulson (American Horror Story series). This riveting culmination of his worldwide blockbusters is produced by Shyamalan and Blumhouse Production’s Jason Blum, who also produced the writer/director’s previous two films for Universal. They produce again with Ashwin Rajan and Marc Bienstock, and Steven Schneider executive produces.